60-64 Marlborough (294 Berkeley) is located on the SW corner of Marlborough and Berkeley, with the First Lutheran Church to the east, across Berkeley, 66 Marlborough to the west, 53 Marlborough to the north, across Marlborough, and 282 Berkeley (29 Commonwealth) to the south, across Alley 423. 60-64 Marlborough (294 Berkeley) was designed by Ware and Van Brunt, architects, and built in 1867-1868 for the First Church in Boston, a congregation founded in 1632 and which became Unitarian Universalist following the Civil War. Prior to moving to the Back Bay, the church had been located on Chauncy Place. On June 29, 1865, the proprietors of the First Church agreed to sell its property on Chauncy and buy property for a new church. 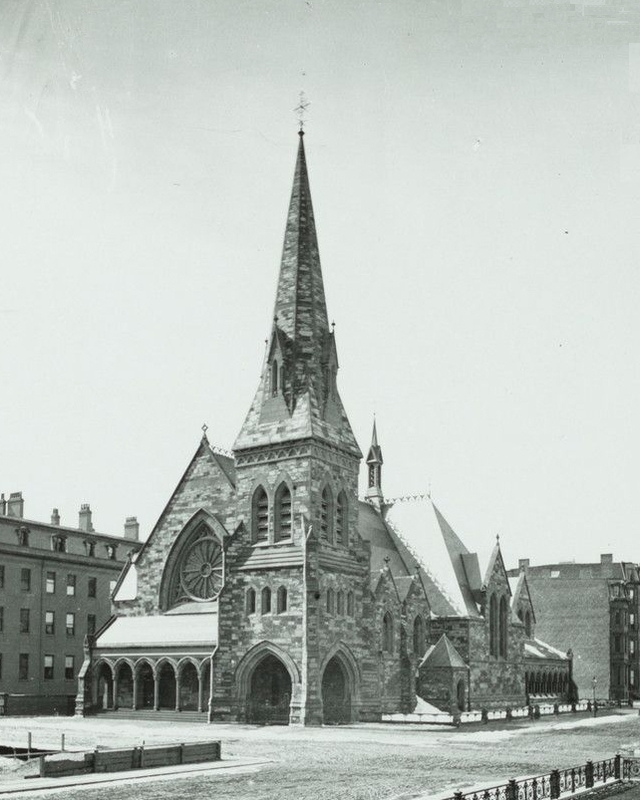 On September 15, 1865, the Church entered into an agreement with the City of Boston to purchase the land at the corner of Marlborough and Berkeley. Under the agreement, the Church paid $3 per square foot, payable ten percent in cash and balance in nine installments at six percent interest. The final payment was made in 1876 and the City transferred the land to the Church on April 20, 1876. The land was part of a larger parcel on the south side of Marlborough extending 250 feet west from Berkeley which the City had acquired from the Commonwealth of Massachusetts on July 7, 1859, as partial settlement of its dispute with the Commonwealth over rights to lands in the Back Bay. 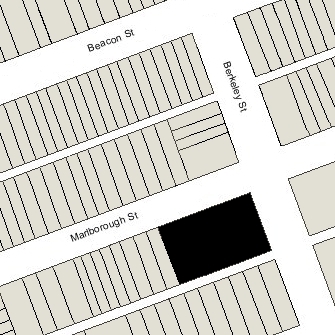 Click here for an index to the deeds for 60-64 Marlborough (294 Berkeley). The cornerstone of the new church was laid on April 4, 1867. The first services were held on May 17, 1868. The History of the First Church in Boston: 1630-1880, by Arthur B. Ellis, includes a description of the original interior of the church written by Ware and Van Brunt. Click here for an excerpt. In October of 1952, the church acquired 66 Marlborough to serve as its parish house. 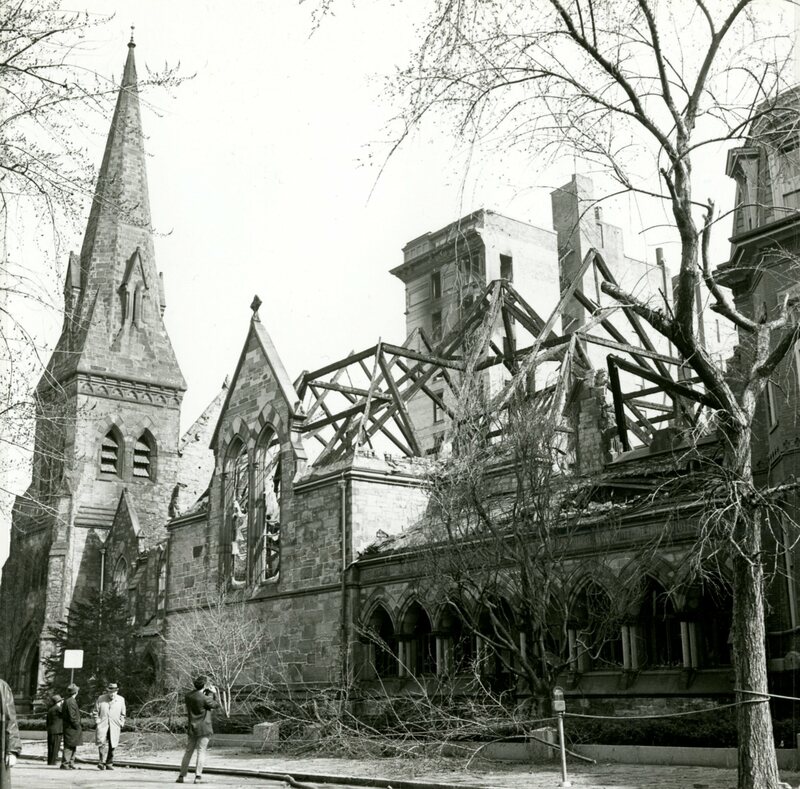 The church was severely damaged by fire on March 29, 1968. In 1970, the First Church merged with the Second Church (a congregation founded in 1649, and which most recently had occupied a church designed by architect Ralph Adams Cram in Audubon Circle). The church was rebuilt to a design by architect Paul Rudolph which preserved the tower, porch, and end wall, and created an amphitheater-like entry on Marlborough Street. The rebuilt church was dedicated in 1972 as the First and Second Church in Boston. 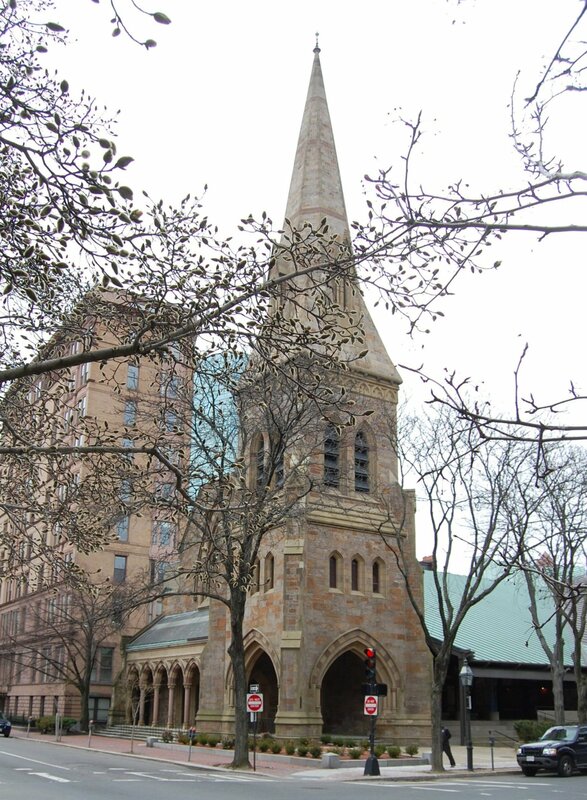 In 2005, the congregation voted to change its name to the First Church in Boston.